Prior to becoming an author, Nancy Lind Corradini worked as a librarian and shopkeeper. She retired early so she could play soccer and read to her grandchildren from her vast collection of picture books. 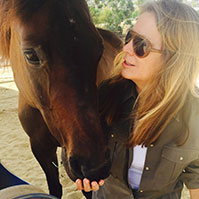 Seeking a new experience, Nancy decided to transition her husband’s racehorse to a pet. What followed was the heartfelt journey of acceptance, friendship and fun shared in this story.